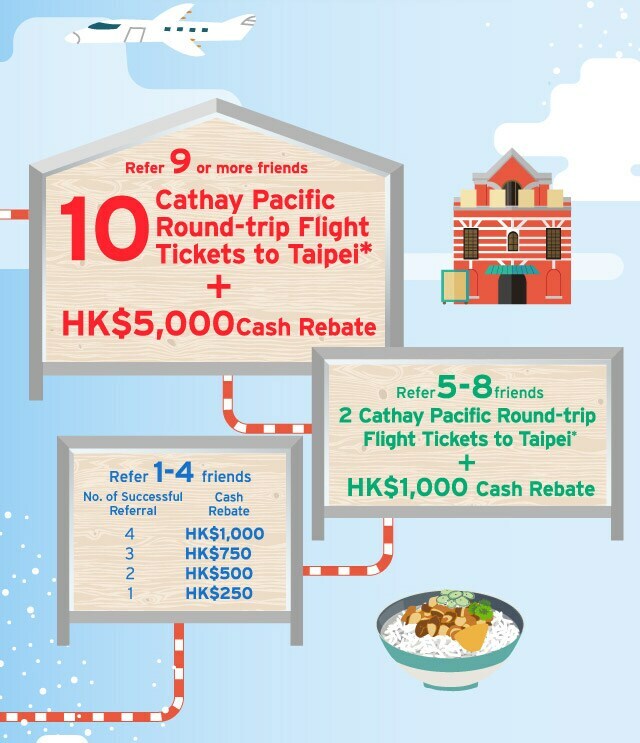 6 Cathay Pacific round-trip flight tickets to Bangkok* and HK$8,000 Cash Rebate! 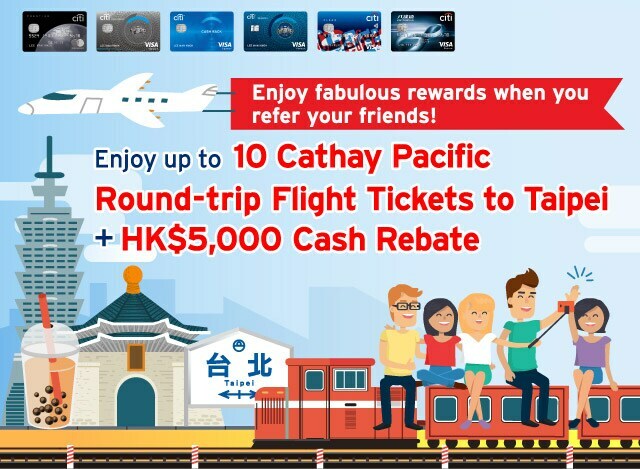 *This reward is provided by Cathay Pacific Airways Limited, and is limited to the round-trip economy class air tickets (“Air Tickets”) traveling from Hong Kong to Bangkok respectively by Cathay Pacific Airways Limited. The eligible referrer shall redeem the Air Tickets on or before October 31, 2019 with the redemption email sent by Citibank and the departure date must be on or before April 30, 2020 (“Reward Fulfillment Period”). The eligible referrer shall pay the taxes, fuel surcharges, airport construction fee and other administration fee of the service provider, if any, subject to the terms and conditions of the service provider. Ticket fare and details on specific date(s) may subject to change and the eligible referrer may be required to pay the extra amount between the adjusted and original price. 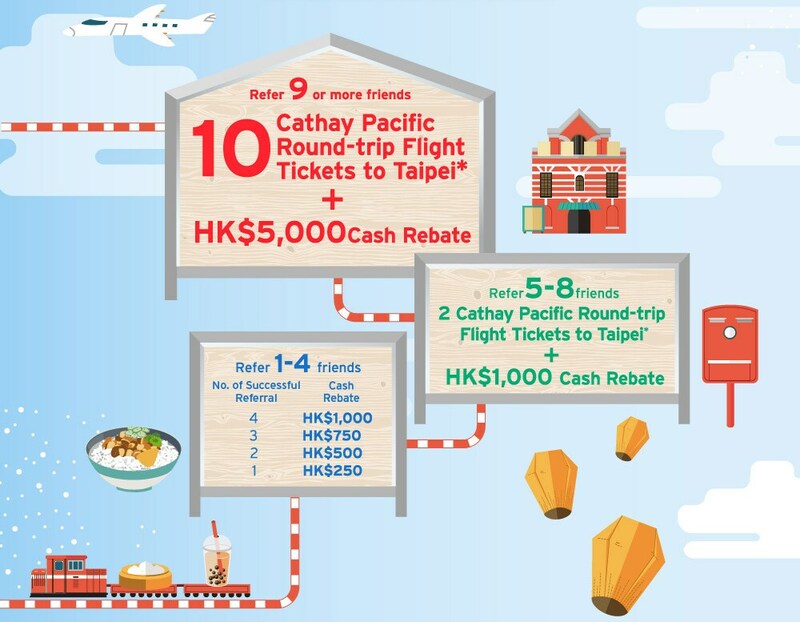 The price and details of Air Tickets will be subject to the final decision of Cathay Pacific Airways Limited. To earn your free getaway, how many friends can you refer? Bangkok* and HK$8,000 Cash Rebate! 1. Unless otherwise specified, the promotion period is valid from January 21 to April 22, 2019, (both dates inclusive) ("Promotion Period"). 2. The Referrer must be an existing principal cardholder of Citi Credit Card issued by Citibank (Hong Kong) Limited ("Citibank") ("Referrer's Credit Card"). 3. The Referee must be directly referred by the Referrer and successfully applied for a principal card of Citi Prestige Card, Citi PremierMiles Card, Citi Rewards Visa, Citi Cash Back Card, Citi Octopus Credit Card or Citi Clear Card, except Citi Clear Student Card issued by Citibank ("Designated Card"). The Designated Card application must be successfully approved by Citibank on or before May 17, 2019, subject to Citibank’s system records. The Referee's Designated Card has to be activated within 1 month after card issuance in order to join this Program ("Successful Referral"). b) Any Referrer's Credit Card number. The Referee is required to ensure the accuracy and validity of the Referrer's Reference Code or Referrer's Credit Card number provided through the concerned website, and the record cannot be changed once submitted. A Referee who currently holds and has held any principal card of Citi Credit Card issued by Citibank within the past 12 months from the date of issue of the Designated Card will not be eligible to participate in this Program. 5. Each Referee can only be referred ONCE during the entire Promotion Period. With reference to Citibank’s records, if the same Referee submits the same Successful Referral more than once with a different Referrer's Reference Code or Referrer's Credit Card number, only the Referrer whose Referrer's Reference Code or Referrer's Credit Card number submitted in the first Successful Referral will be used to determine the eligibility to this Program. 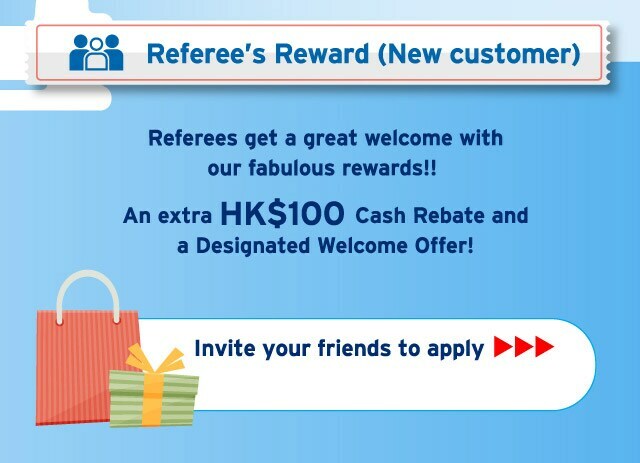 • Referee’s Reward: Each Referee can enjoy HK$100 cash rebate and the respective Designated Card’s welcome offer, subject to each Designated Card’s welcome offer terms and conditions as stated at www.citibank.com.hk/card. 7. The Cash Rebate of the Referrer’s Reward will be credited to the corresponding Referrer’s Citi Credit Card accounts respectively by July 31, 2019. 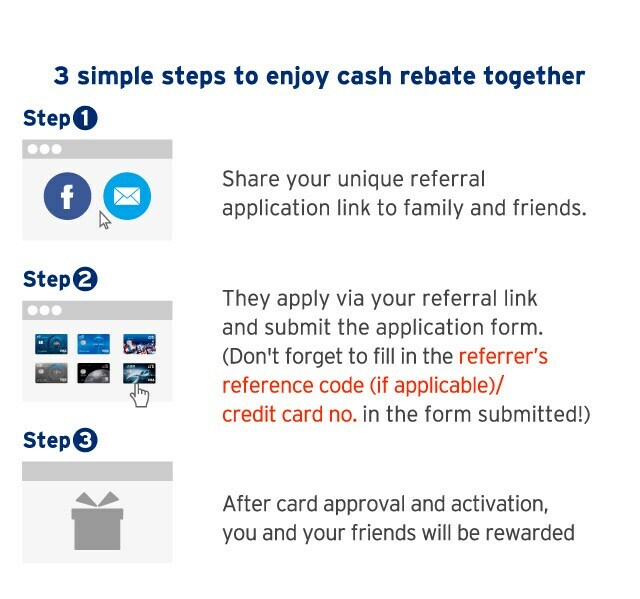 If the Referee provides the Referrer’s Reference Code through the dedicated website from a Referrer who owns more than 1 Credit Card account, the Referrer’s Cash Rebate will be credited to the Referrer's Credit Card account in valid status and with the highest card transaction amount based on the Citibank’s system record from December 2018 – May 2019. Also, if the Referee provides the Referrer’s Credit Card number through the dedicated website, the Referrer’s Cash Rebate will be credited to that Referrer's Credit Card account. 8. The Air Tickets redemption email will be sent to the eligible Referrer’s email address on or before July 31, 2019. 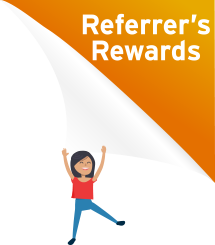 Please refer to the Referrer’s Reward redemption email for the Air Tickets redemption method and the terms and conditions of the Air Ticket Redemption. 9. 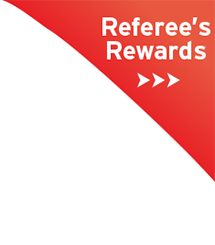 Both the Referrer's Credit Card and the Referee's Designated Card must be valid and in good standing during the entire Promotion Period and Reward Fulfillment Period in order for the Referrers and Referees to receive the Reward. 10. As Citibank is not the service provider of the Air Tickets, Citibank does not warrant and cannot be held liable for the supply or quality of service and herein makes no representation or warranty in relation to the service. In case of any bad weather or special circumstances that affect the flight schedule, the holders of the Air Ticket shall refer to the announcement or notification made by the service provider. Citibank shall not be liable for any loss or damage whatsoever which is suffered (including but not limited to indirect or consequential loss) or for personal injury which is suffered or sustained, as a result of taking or using any of the Air Tickets. 11. Self referral is not accepted. Any Citibank staff employed by Citibank or Citibank N.A. or its subsidiaries are eligible for this program as a referrer excluding Citibank Global Consumer Banking staff who are (a) eligible for any other incentive programs relating to other credit card referrals, (b) sales representatives under incentive shall not be eligible, (c) contract staff hired by third party agency under sales incentive scheme shall not be eligible, and (d) staff to staff referral and referee arrangement, shall not be eligible for any referral and referee offers with this promotion. 12. This Program is not applicable to US Persons. 13. This Program is not applicable to Referrers and Referees if the Referee is a resident individual of the European Union, European Economic Area (EEA) or any other jurisdictions where referral activity is restricted. 14. Citibank and the respective merchants reserve the right to amend these and relevant terms and conditions at any time without prior notice. 15. All matters and disputes will be subjected to the final decision of Citibank. 16. In the case of discrepancy between the English and the Chinese versions of these terms and conditions, the English version shall prevail.